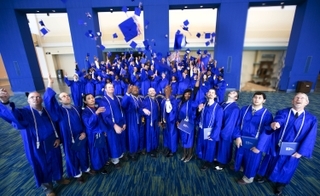 PASCAGOULA, Miss., July 11, 2011 (GLOBE NEWSWIRE) -- Huntington Ingalls Industries (NYSE:HII) held a graduation ceremony for graduates of Ingalls Shipbuilding's Apprentice School on Saturday, July 9. The ceremony, held at the Mississippi Coast Coliseum and Convention Center in Biloxi, included 162 students from 13 different crafts representing shipbuilders from Ingalls' Pascagoula, Gulfport and Avondale sites. Rear Adm. David H. Lewis, the U.S. Navy's program executive officer for ships, provided the keynote address and challenged the apprentices, saying, "America's maritime future is depending on you to know your job and perform it flawlessly. "You are now all shipbuilding professionals," Rear Adm. Lewis continued. "You may not be wearing a uniform. You may not be going to sea. But you are central to achieving mission success for those who do wear the cloth of our nation. You will be with them in the steel and cable and equipment you have designed, installed and tested on the ships you build." Ingalls Shipbuilding's apprentice program is a comprehensive, two- to four-year curriculum for students interested in shipbuilding careers. Since 1952, the Apprentice School has produced more than 4,000 graduates in support of the operational needs of Ingalls Shipbuilding. More than 60 faculty and staff teach 15 different programs and more than 120 course offerings that enable apprentices to gain not only the skills, knowledge and pride of workmanship, but also the educational foundation and personal qualities needed to fully meet the challenges of a shipbuilding career. Today more than 430 alumni of the school fill approximately 50 different types of jobs—from pipe welders to senior executives. "As an apprentice graduate, you have decided to take ownership of your career," said Ingalls Shipbuilding President Irwin F. Edenzon. "You've proven that you know how to work hard to achieve your training and educational goals, and as an apprentice graduate you have built a solid foundation to achieve your career goals. Many members of our executive team—superintendents, directors and vice presidents—are apprentice graduates. I know their apprentice training, commitment to continuing education and hard work laid a solid foundation for their success, just as you have taken this step in preparing for your future." Special awards were presented to Outstanding Apprentices of the Year: Avondale pipefitter Calvin Miller and Pascagoula shipfitter Wilfred Bolds Jr. Justin Harris was named Designer Apprentice of the Year. Education leadership awards were also presented to Kevin Joyce, director of the Louisiana Workforce Commission's Incumbent Worker Training Program, for his contribution to the Apprentice program at Avondale; Fred Westcott, state director of Mississippi's U.S. Department of Labor Office of Apprenticeship, for his work with the Pascagoula program; and Woody Ogé, director of business affairs at Avondale, for his hard work in various partnerships with local, state and federal business relations. For more information on Ingalls' apprentice program, visit the school's website at: www.apprenticeschool.com/gc.